Do Online Colleges Have Graduation Ceremonies? 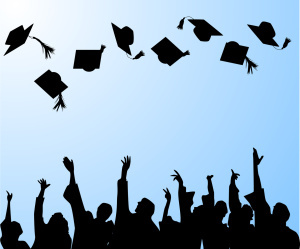 A graduation for online college graduates may be far different than the celebration would be if you attended a traditional college. If you are in the process of comparing the differences between earning a degree online and earning a degree on-campus, there are several different factors to consider. Not only do you need to know how lessons are taught, how you can communicate with professors, and how you can interact with other students, you also need to know what to expect as you approach your graduation. Read on, and learn about how online students celebrate achieving the milestone of earning a degree when they are not attending school onsite. There is a major difference between commencement and graduation even though many people use the two interchangeably. When you attend an online college, no matter what college it is, you will go through the process of graduation. Graduation is a three-step process which starts when you complete the credits you need to graduate and fill out your application for graduation. Once you are approved and you meet all of the financial requirements and academic requirements, the administrative process will end and you will be granted your degree that shows your date of graduation. A commencement is not the administrative process of graduating, but instead the ceremony where the President of the school speaks and other keynote speakers will address the student body. Your family is invited to come and celebrate your accomplishment. At the commencement, you will receive a certificate of participation and you will walk the line. You may also be granted with other awards for your achievements, but your actual degree will be sent to you in the mail. Just because you are studying online does not mean that you will not have the opportunity to celebrate your graduation in-person. It can be much more exciting to attend a graduation ceremony that is exclusively for online students because you will meet the students that you have communicated with virtually for so long in person. Most schools, both traditional and online, will have a biannual graduation event so that you can receive your diploma in either the winter or the summer. Commencements are usually held on-campus, but not all online schools have a campus that students can go to. If you are attending a national college with no locations in your area, there is a chance that you will attend a national commencement. If this is the case, you will receive special discounts for travel and accommodations. If the ceremony is too far away or the school is hosting a virtual commencement, you may be about to celebrate by attending a virtual ceremony. It is essentially like being awarded your degree where you earned it– on the world wide web. Even family can log on and enjoy the festivities from across the globe. There are several benefits to attending an online university. If you want the flexibility that these modern institutions offer, studying online could be the solution. Make sure to consider the differences from beginning to end. You will need to consider your schedule and learning style first. After you consider this, ask about the graduation for online college grads and decide if this is how you want to celebrate.